The last weekend before my departure to Kyôto, I attended the grand launching of Telkom Group’s IPTV product. We call this new product Groovia. The name was obviously taken after the word groovy. But Telkom also planned to have a kind of product with similar success to Google, Yahoo, Facebook, Joomla, and other 2.o products (i.e. products with two consecutive letters o). 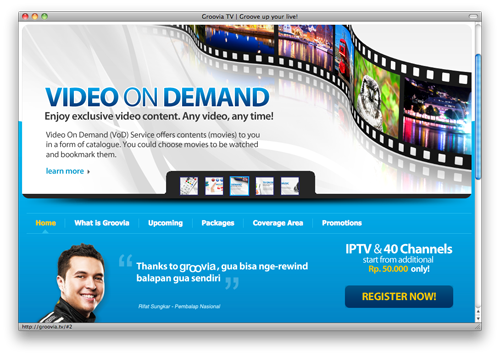 Groovia is not just the implementation of IPTV to distribute television content over the Internet. IPTV is intended as a synergy between the power of the Internet with its web interactions, with the power of broadcast television media. IPTV is regarded as the next step in developing the service platform for multimedia interactions services. TV on Demand: a service to offer television content with interactivity, and with a recording facility in the network; which allows such control as the video service: pause, rewind, replay, scheduled reports, and others. Video on Demand: non-television multimedia contents that are included in this service, including video films, music, karaoke, etc., with various forms of interaction. 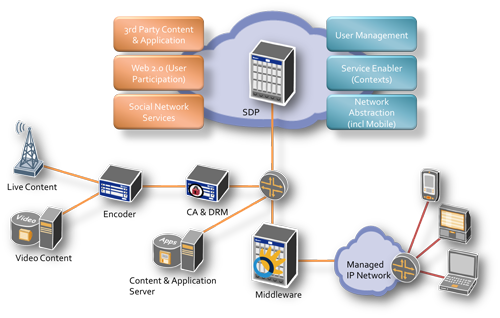 Web Service: the interactivity of the cyber world that is integrated into the television system. The services consist among others the social networks, news, weather, stocks info, and others. The next year, more services such as e-advertising, e-transaction and e-shopping are expected to be integrated into Groovia. In infrastructure layer, the integration of IPTV, SDP, and other platforms, such as store content & applications, is expected to be carried out smoothly, establishing an efficient and comfortable multimedia interaction ecosystem. But the users will ask: ain’t it costly? The customers of Telkom Speedy with data rate 1, 2, or 3 Mb/s will need only to pay about US$ 5 more to its Speedy monthly subscription to have the Groovia service. Not too expensive for the status as a taste-maker :). Richer contents could be selected according to individual needs of every user. 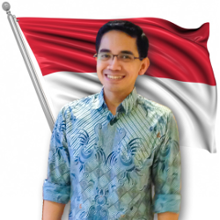 Unfortunately, Groovia is still in the initial deployment phase, and is available only in certain areas in Jakarta. Deployment to other Indonesia cities will begin later this year. I don’t know whether this is a sincere comment or just a (kind of) spam. At least you comment an english blog with an english comment that looked valid and relevant. iptv nya blum ok ….. msan pada ngedown, kalo bsa kabel kt dan ku nya diganti fo semua………. Groovia juaga sudah muncul iklannya di TV. Gimana ya cara daftarnya? Hi, I’m interested to partner with Groovia TV to offer our live channels. Could you please advise whom should I contact? thank you. This product is promising. It will one day become a hit because most people are on the internet. It is not surprising that even television viewing will be internet based. Please keep me advised of the development of this service. Is there any new information available.